This volume comprises of 21 selected chapters, including two overview chapters devoted to abdominal imaging in clinical applications supported computer aided diagnosis approaches as well as different techniques for solving the pectoral muscle extraction problem in the preprocessing part of the CAD systems for detecting breast cancer in its early stage using digital mammograms. 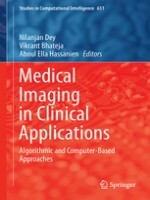 The aim of this book is to stimulate further research in medical imaging applications based algorithmic and computer based approaches and utilize them in real-world clinical applications. The book is divided into four parts, Part-I: Clinical Applications of Medical Imaging, Part-II: Classification and clustering, Part-III: Computer Aided Diagnosis (CAD) Tools and Case Studies and Part-IV: Bio-inspiring based Computer Aided diagnosis techniques.